Dogon bangles, two simple and plain but treasures in their own right. Dogon bangles, a pair of simple but treasures in Dogon jewellery. Two metal/bronze bangles made and worn by the Dogon. Circular with diameters of 8cm and 9cm. One bangle is made from bronze, the other a metal of unknown composite. Only one bangle has any decoration present and that is very minimal, two shaped ends where the circle joins with two lined rings either side. A green oxidization is present throughout both bangles. Both these bangles are quite heavy. Among the Dogon, jewellery often serves as much more than just personal adornment. For example, bracelets, rings and necklaces might signify that the owner/wearer is linked to ancestors or perhaps spiritual leaders. Jewellery most certainly identifies the wearer as a priest, Hogon or caretaker of a particular alter within the village. 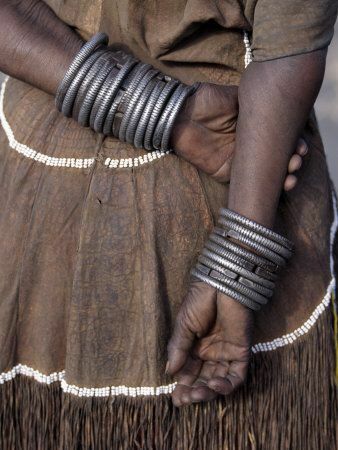 Indeed it is very usual to see, especially a Hogon within the Dogon village wearing not only bangles but also many necklaces adorned with many charms or amulets for protection. In the same vain the hunters of the village also adorn themselves with both bangles and protection amulets.The metal workers, known as the blacksmith, who make these items of Dogon jewellery are famed for their extraordinary skill in constructing such precious pieces of tribal art. Many designs being created that resemble bearded figures, sun, stars, snakes, rabbits and monkeys are just a few. Of course jewellery is also worn by the women as a means of adornment either a single bangle or more than one. Bangles not always just being worn by one person but also being passed from one person to an other. Being used as a form of currency, the value and wide meaning of an everyday item such as this carries more than just the idea of a fashion accessory.